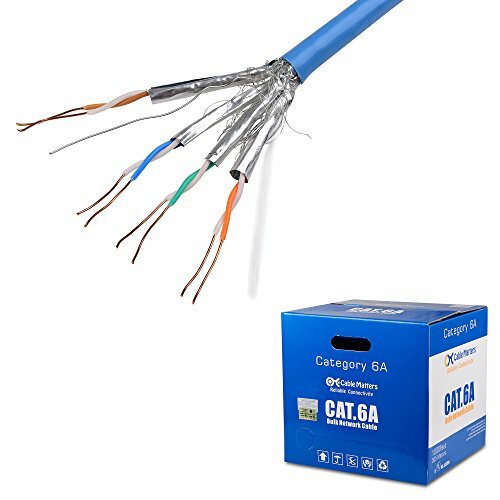 The Cable Matters Cat 6A Shielded (S/FTP) Bulk Cable is the perfect choice for building a 10-Gigabit Ethernet network or for high bandwidth video applications requiring protection from noise interference. Achieve optimal transmission performance for longer distances with foil shielding around each 2 pairs with an outer braided screen that is encased in a sturdy CM rated jacket for in wall use. Constructed of 23 AWG solid bare copper conductors and compliant with the UL Code 444 pure bare copper requirement. Shielded Cat 6A cable provides reliable Gigabit Ethernet performance in harsh environments with electrical noise from lights or other sources. A lifetime warranty is included with this cable for peace of mind when purchasing.